Here are some quick tips to help you import your patient/client list into eNoteFile. After logging into eNoteFile you’ll be able to import your patient/client list. You’re able to upload a csv (type of excel spreadsheet file) on the patients page. Please note that you’ll have to get it into the correct format for it to import successfully. 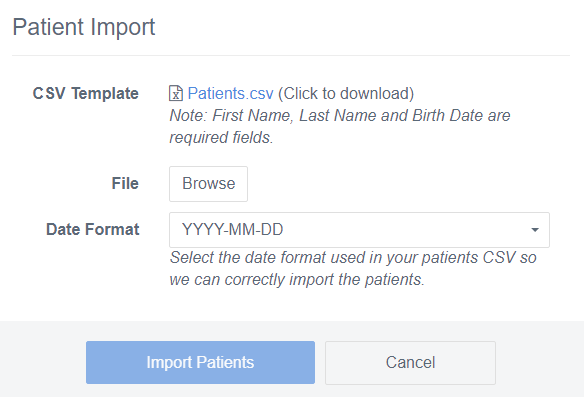 When you start the import process, you’ll be able to download a template (Patients.csv) to help you format your spreadsheet. Alternatively, you can send us the patient list (preferably in an unedited/raw csv file) and we can help you format and upload your patients. Just want to use clinical notes? Wanting to use eNoteFile Practice Manager with Clinical Notes?